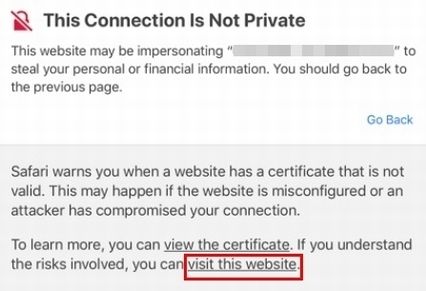 How to Deal with the warning message "This Connection Is Not Private" displayed in iOS 11 - Details of an answer | Buffalo Inc. Your connection may not be secure. You should ask the administrator whether the page is safe or leave the page by clicking "Go Back." In case the same warning message is displayed when accessing Internet@Start, AOSS2 or guest port through Buffalo's Wi-Fi router, your connection is secure. Please access according to the following procedure.